The Full Moon Hotel is a 4-Star hotel situated at H1, Full Moon Avenue, off Akanchawa, road by Nekede junction, housing area C, New Owerri. 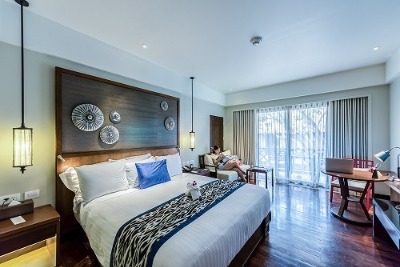 Full Moon Hotel boasts over 70 rooms with state of the art facilities and breathtaking beauty. The rooms are classified into: Premiere, Deluxe, Executive, Pent House Single, and Pent House Double. Each room comes with excellent services and amenities which include: Wifi internet connection, flat-screen television with multi-channel satellite, air conditioning, ensuite bathroom with stand-in shower, refrigerator, mini bar in the room, hair dryer and toiletries, daily newspapers delivered to rooms, telephone, cribs on demand , balcony and sitting area. Guests at the Full Moon Hotel get to take advantage of world-class hotel services and amenities which include top-notch security supported by the use of CCTV cameras, adequate space for guests to park their vehicles, swimming pool, restaurant with a wide range of dishes on offer, meeting rooms, conference hall with standard conference facilities, karaoke Bar/lounge, well-equipped gym and uninterrupted electricity supply. The Full Moon Hotel also provides guests with an elevator for easy movement within the hotel building; a mini mart for convenient shopping; laundry and dry cleaning services and round-the-clock room service. Children: Allowed as long as they have not exceeded the age of 5. Q: Does Full Moon Hotel have a gym? A: There is a gym available for guests who wish to keep fit. Q: Is there enough space for guests to park their vehicles? A: There is ample parking space provided to accommodate guests' vehicles. Q: Is there free internet access at full moon hotel? A: Free and high-speed wifi internet connection is provided for guests. Q: Does Full Moon Hotel have a swimming pool? A: There is a large-sized outdoor pool for the recreational pleasure of guests. Q: What extra services are offered at the full moon hotel? A: A wide range of extra services are made available to guests. These services include the provision of an in-room bar, newspaper supply and laundry services. Full Moon Hotel is a top-class hotel in Owerri, Imo. Strategically located. Clean and quiet. Good place to rest. You won't realize how fast time flies in this hotel. What I appreciated the most is the choice of colours from the furniture, to the tiles, to the wall such amazing combinations. I mean what else do you want from a hotel? I would definitely recommend this hotel a million times over. I just pray they keep this standards. Thumps up. Full moon crew. Good job! The hotel is quite nice. The room I stayed in was well cleaned and all the facilities there worked well. Power and water supply were stable.The environment was cool and had a good ambiance. Good customer service as well. However, the food is not so good and the kitchen unit has limited menu. They do not have variety of dishes which is not so good. Everything else was just alright during my stay at the hotel. I have stayed in a couple of hotels within and outside Nigeria, but I felt compelled and obligated to drop a review on this hotel, my first ever. I Came in to Owerri with friends for a wedding ceremony over the weekend. We went to the hotel after viewing others in the city. Right from the entrance we knew we had hit the jackpot. The ambiance was lovely. The staff, at the reception, were so nice and helpful. We were shown all classes of rooms in the hotel. We all checked in and went down to have lunch at the restaurant. Great local and continental dishes at an affordable rate. After that, we went for a swim in the pool. Very well maintained pool. A slight incident happened in the pool, and the staff responded swiftly with a first aid kit, and were willing to take the injured to a nearby hospital. Indeed that was commendable. After that we went to our rooms for a nap and came down back to the pool side for a night of merriment. There is a very well stocked bar and club/karaoke bar. Fantastic DJ. Good people. The music from the club can not be heard from the rooms. Next morning was breakfast. Among the variety of food, they had omelettes with onions in them. I kindly requested if I can have mine fried without onions, and without a moment of hesitation 'Chika' said that would not be a problem. Thumbs up again. To cut a long story short, I thoroughly enjoyed my stay there and will undoubtedly be there anytime I'm in Owerri. Staff 100% Fresh smelling hotel and sheets 100% Food 100% We really could not fault anything during our stay in the hotel. Keep up the good work. My stay at the hotel was a splendid one, the security I met at the hotel made me feel safe. The room was big and had a lot of good stuff in it, the air conditioning unit worked perfectly well and it came with a remote. But one of the bulbs in my room was not working perfectly. This is one of the 'hidden gems' in Owerri. Ample space - parking, swimming pool, lobby, restaurant, rooms etc. Still quite new and well finished. Key qualities are its ambience and quiet location, close to but far enough from the entertainment spots in New Owerri. Good service, very polite and well trained staff. Nice place. Have nice pictures of Full Moon Hotel?